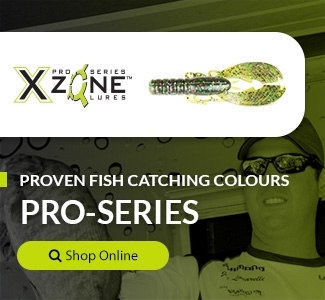 When you are looking for a bait to attract the fish when they might be finicky, X Zone Lures now has the Pro Series Muscle Back Finesse Craw 3.25" in a slim and slightly smaller profile to attract the bass. X Zone Lures Pro Elite Brandon Lester has been successful on the tournament trail and secured a 2nd place finish in Bassmaster Elite Southern Opens on Lake Okeechobee using this exact lure. Knowing when and where to use this bait will make you a successful angler. This smaller profile craw can be used on lakes that are prevalent with craws and in colder conditions, when water conditions are less than 50 degrees, the bass might not be as hungry so this smaller presentation bait might be the bite. If certain areas of your lake are susceptible to high pressure from plenty of anglers, the fish become accustomed to certain lure types. By throwing this NEW X Zone Lures Pro Series Muscle Back Finesse Craw, on a light line and weight, it might be the bait that the fish will be attracted to. In post spawn or hot summer conditions, bass tend to lose their appetites for large meals. This smaller profile bait in various colors could be a great presentation to make them strike. This new lure offers a Muscle Back design down the center of the lure in which you can securely rig your hook through the middle. The floating craws allow the lure to give the defensive stance of an actual craw fish, giving it a realistic appearance to the bass. You can rig it texas style and flip the mats or use it as a trailer, either way, give this NEW X Zone Lures Pro Series Muscle Back Finesse Craw a throw and we hope you land a big fish.